A Doublet puzzle consists of a list of words, all of the same length. The first and last words in the list are given, and are called Anchor Words. Each of the intervening words is defined by a clue, just as in a crossword puzzle, but in addition it is formed from the previous word in the list by the application of one of a set of Doublet Rules. Currently, there are three rules, giving rise to a family of three types of Doublet puzzles. 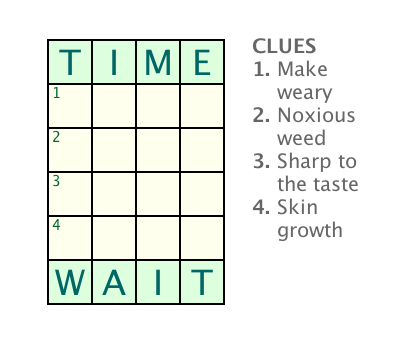 The following graphics show a Doublet puzzle in the Crossword Express Build screen and a PNG graphic file produced by the program's print function, showing the complete puzzle. See also a full size version of a PDF file showing the complete puzzle. 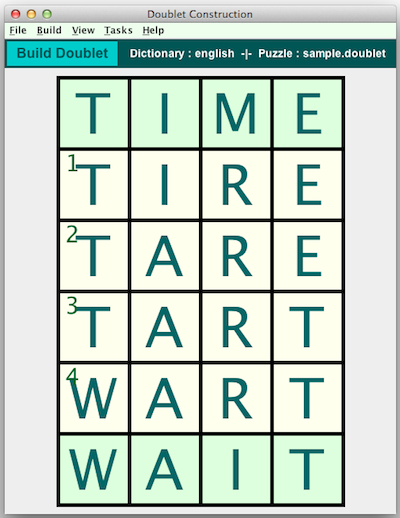 Fully automatic construction of puzzles using anchor words ranging in number from 2 to 5.